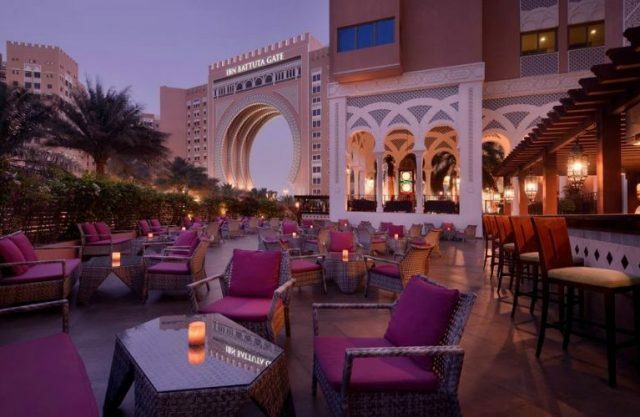 Mövenpick Hotel Ibn Battuta Gate, The Gardens, Dubai United Arab Emirates. Whether at the bar or on the terrace that overlooks the iconic gate, Moroc Lounge & Bar offers our guests a chance to enjoy tapas, mini kofta burgers, shish tawouk, grilled haloumi and Arabic hot mezzah such as fatayer, kebbeh, and sambousek. On the beverage front, the casual Moroccan lounge serves specialty teas, coffees, and thirst-quenching cocktails, along with a unique premium shisha menu.